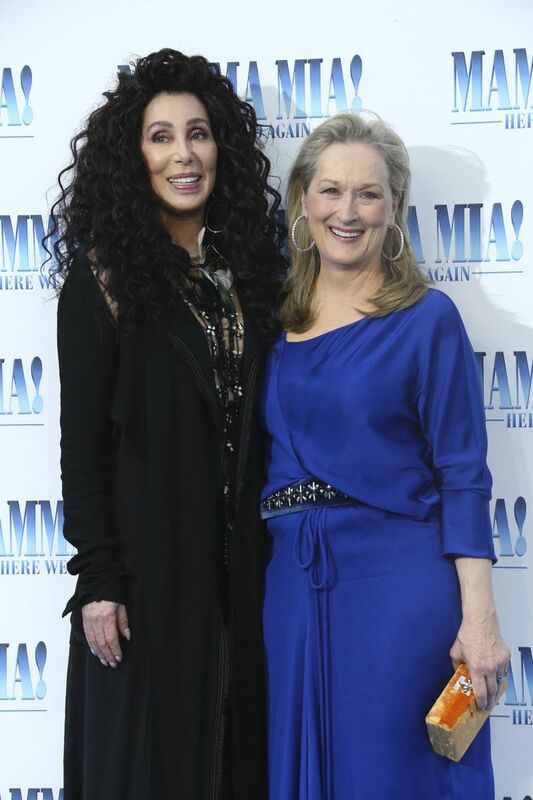 Cher and Meryl Streep share the big screen again in "Mamma Mia! Here We Go Again." This photo of Cher and Meryl Streep isn’t really about the outfits, though each nicely suits its wearer (though, while we’re here, I’d quibble that Streep’s bag doesn’t really go, and Cher’s hair maybe didn’t have to be quite the size of Australia). The red carpet for “Mamma Mia! Here We Go Again” — in which they inexplicably play mother and daughter, despite Cher being only about three years older — was a reunion of sorts: The two last shared a screen 35 years ago, in “Silkwood,” for which both were nominated for Academy Awards. They’re not likely to repeat that feat this year, but it’s nice to see them together again. And I suspect that, if you dug up red-carpet photos from that time, you might see them dressed in similar looks. Movies come and go; style sticks around.